A wrap dress I wore on 23rd March 2014. Exactly a month ago. This was the day I went to see the dearly departed and much-missed blogger friend Ami Schaheera at the hospital just a few days before she unexpectedly passed away. The day I went to Mufti Menk’s talk at Pullman Hotel Bangsar with my sister Fahima Salleh. The day I went to dear Lisa Surihani’s kenduri doa selamat at her home. This was what I wore. That day. To be honest, I’ve been wanting to blog about this look since about 1 month ago but there were things in my mind and my heart which stopped me from doing so. I realized this past week that a lot of my unpublished or un-blogged posts are basically a consequence of this reason. Something that I feel like sharing but I know I couldn’t share here. It’s a bit complicated to explain but it’s like I have a personal attachment regarding certain things so those things that I am unable to put in words stops me from posting what should be a simple straightforward post. Something that I just have to learn to overcome as a blogger. See? This should be in another post! Maybe I’ll blog on that one day. Back to the look that I wore. As I was going to a talk I thought the abaya-like dress would be appropriate as it looks very modest and as Lisa told me that the theme to the doa selamat was pastel-ish, I chose to wear the pastel grey shawl and the pastel coloured ikat jeans. The last time I wore the jeans was when I was pregnant 2 years ago. Love it as it is a gift from the husband. 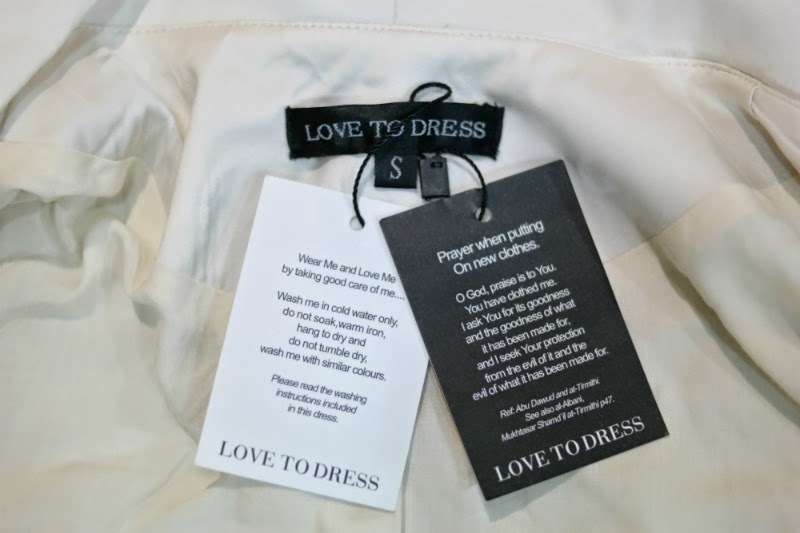 I love that the tag of the dress mentions the prayer when putting on new clothes. So thoughtful. I wore the dress the whole day that day and it was really comfortable and I’ve always liked dresses with zip at the arms which makes it easy for ablution before prayers. I think the first dress I wore last year was the Syomir Izwa dress by Zawara. Last year I’ve worn a dress from Love to Dress too. See my post “Twirling in Love to Dress”.